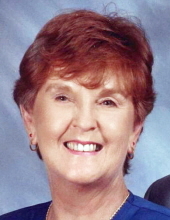 Julia Gayle Cox of Oak Ridge, TN passed away on January 15, 2019. Judy was born May 25, 1937 in Smithville, TN to Ernest and Claudine Groom Malone. She graduated from Liberty High School and attended Tennessee Tech University where she met Don Cox. After their marriage she and Don lived most of their lives in Oak Ridge, TN. She worked at the Y-12 Plant in Oak Ridge and the Anderson County Courthouse. She was a member of the New York Avenue Church of Christ in Oak Ridge where she served as Church secretary. She was also a member of Highland View Church of Christ in Oak Ridge. After retirement, she and Don spent their winters in Punta Gorda, FL and were members of the Port Charlotte Church of Christ. She and Don were Lifetime Members of the International Brotherhood of Magicians Ring 58. Judy was preceded in death by her husband of 59 years, Don Cox, two sons Jon David Cox and David Nathaniel Cox and parents, Ernest and Claudine Groom Malone. She is survived by son, Mark Malone Cox of Oak Ridge, grandson, Aaron Jon Cox (Natasha) of South Carolina, sister, Joyce Malone Johnson of Murfreesboro, TN, sister-in-law, Judy Cox Wallace (William) of Oak Ridge, and numerous nieces, nephews, cousins, and a host of friends. The family will receive friends on Saturday, January 26, at 11 am at New York of Avenue Church of Christ in Oak Ridge with a Celebration of Life service immediately following at 12 Noon. Tim Hardy and Curtis McClane will be officiating. To send flowers or a remembrance gift to the family of Julia Malone Cox, please visit our Tribute Store. "Email Address" would like to share the life celebration of Julia Malone Cox. Click on the "link" to go to share a favorite memory or leave a condolence message for the family.